I just love the way mascara enhances our lashes and gives them gorgeous, thicker and lengthier feel. It is indeed a very essential part of our makeup kit, but it requires proper maintenance and frequent replacement also. An average mascara tube should be replaced within three months from the date of opening without fail; or it may result in eye infections. But many times, mascaras tend to become drier and clumpier even before three months and need to be tossed up earlier. But, fret no more, there are few things we can do to get the all-out value out of them for that three month period. • Before applying mascara daily, roll the mascara between the palms to warm up them little, this helps in thinning the solution and makes the application pretty smooth. • Never pump the wand into the tube as pumping the wand in and out traps the air in and dries the solution faster. Just roll the wand within the sides of tube, as stated above. • Always ensure that the tube is closed tightly after use and store it in cool and dark place. • When buying a mascara, if possible, check the manufacturing date and go for the ones that are not going to expire for at least a year. I know this is not possible with online shopping. • Water soluble mascaras are best for regular use as they come out easily compared to water proof ones which require lot of effort to remove. Also, they last longer! • Never sleep with your mascara! Always, always remove it with a good makeup remover before dozing off. Otherwise, see all your eyelashes fall off within some time. Next, we can do some things to make our mascaras last longer and to ensure that the solution remains like it was on first day of usage. In case you find your mascara has become dry and flaky, try these tricks to revive it! Fill your coffee mug with hot water and dip the tube of mascara in it for few minutes. The heat will do miracles to your mascara – it will soften the dried solution and mascara will be as good as new. If your wand is loaded with dry and flaky solution, run your wand under hot water until it gets squeaky clean and dip it back into the tube. The warmed up wand will moisten the solution too. I wore contact lenses for years before I got my lasik surgery done and this is one trick which I have tried most. Just add few drops of saline solution like the one which are used to clean and soften contact lenses to the tube of mascara. And, warm up the tube by rolling between the palms for a minute. This will help in getting rid of any clumps and will also thin the solution. Take caution and do not to add more drops as it will make the solution very thin and difficult to apply. Just check by adding 3-4 drops depending on the amount of mascara left inside the bottle. I get dry eyes very often as I work on desktop screen for long hours and therefore, need to moisten them with eye drops. Therefore, eye drops are always handy for me and many times I moisten my mascara with eye drops too. Most of the eye drops need to be tossed up after one month of opening, just ensure you are using the good one if mixing with your mascara to avoid any contamination. Just add 1 or 2 pea sized shots of aloe vera to mascara tube and blend well by rolling the wand at the sides of tube. This should work well to make the mascara smoother. After you have utilised your mascara at the fullest for three months, it’s time to toss the tube to bin. No! No wait!! 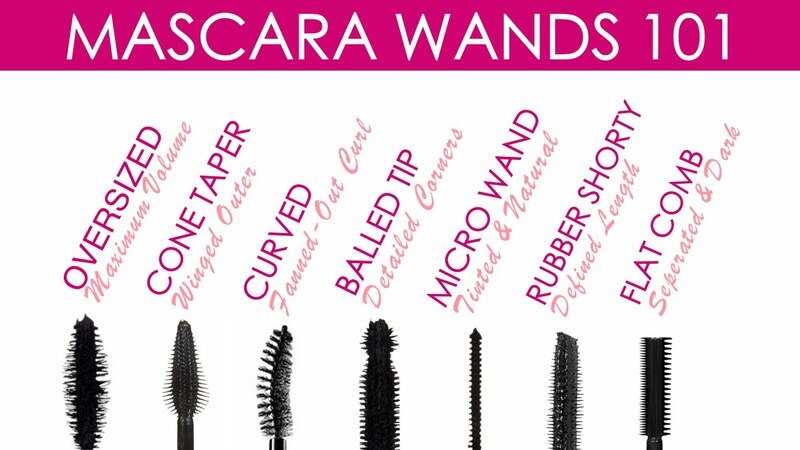 You can make use of dead mascara wand too!! Just take the mascara brush or wand and soak the wand in hot soapy water for few minutes. I use baby shampoo to get rid of all the mascara out of my wand. Rinse and dry the wand and read on further to know what wonders you can do with the wand. We all have heard a lot about Castor oil doing wonders to the lashes. You can use it for conditioning your lashes and eyebrows. Make use of a clean mascara wand to apply the oil, it is much easier and you will see the magic! You may add Vitamin E to Castor oil for some added benefits. You need not buy a separate eye brow brush as you can use the mascara wand to keep your brows in place. You can also use the wand to fill your brows. Just dip the wand in your matching eyeshadow and brush along the eyebrows. You can make use of your clean wand the next time you try a manicure. After applying cuticle remover cream or olive oil, leave it on for few minutes and then gently buff the nail base with the help of mascara wand. It works well to repair and maintain the cuticles. Do you get bothered with unruly baby hairs or flyways after having a sleek hairstyle? Do this simple trick to get rid of those flyaways. Just spray the hairspray on mascara wand and comb those flyaways or baby hair in place. You may replace the hairspray with a coat of Vaseline jelly, it works the same. If your lashes get tangled while applying mascara, you may separate them by gently brushing with clean mascara wand. Just dip the clean mascara wand in some sugar and vaseline mixture or lip scrub and exfoliate along your lips making swift circular motions. This will remove all the dead skin making your lips super smooth. Follow up with your favorite lip color. Good post Soni. I didn’t know it could be used to exfoliate lips. Awesome one Soni..m going use my lens solution to thin my thickened mascara..thank you soo much..